The Jerry and Huddy Cohen Faculty Excellence Fund. The Cohen Fund was established to enable the director of Jewish Studies to recruit, retain, and develop great teacher-scholars. The Harvey Colchamiro Endowment Fund. The Colchamiro Fund is an unrestricted endowment to enable the Center director to meet its most pressing needs as they arise. 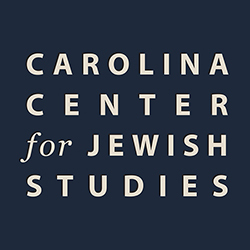 The Director’s Endowment Fund for the Carolina Center for Jewish Studies given by Samuel J. Wisnia to provide support for students studying Jewish history, religion, or culture. The Ambassador Stuart E. Eizenstat Distinguished Professorship in Jewish History and Culture. Established by gifts from his former colleagues and friends, the Eizenstat Professorship honors UNC alumnus Stuart Eizenstat ’64 and will initially be used to recruit an outstanding teacher-scholar in the field of modern Jewish history. The Eli N. Evans ’58 Distinguished Lectureship Fund. Established by an anonymous donor to honor Eli Evans, this fund enables the Center to bring to the UNC campus nationally renowned scholars and interpreters of Jewish history, culture, and experience to speak to students, faculty, and the wider public. Eli Evans is the founding chair of the Center’s Advisory Board. The Sara and E.J. Evans Distinguished Professorship. The Evans endowment was funded by a generous gift by the Crown family. The incumbent will teach courses and conduct research in Jewish history, culture, or thought. Mr. Evans was a member of the Class of 1928. The Sidney and Lois Gordon Family Excellence Fund. The Gordon Fund was created through a generous gift from Lois Gordon in memory of her husband Sidney and in honor of the entire Gordon family. This unrestricted endowment enables the Center director to meet the program’s most pressing needs. The Jay Gould Endowment Fund. The Gould Fund was created through a generous gift from Jay Gould ’62 as an unrestricted endowment that enables the Center director to meet the program’s most pressing needs. The Morris, Ida and Alan Heilig Lectureship Fund. The Heilig Endowment Fund was made possible by a gift from Alan Heilig ’53, and Debra Heilig Schwartz. It supports an annual public lecture on some aspect of the historic or contemporary Jewish experience. The Hockfield Family Jewish Studies Library Fund. The Hockfield Family Fund supports the purchase of library materials in support of Jewish Studies. The Hockfield Family Fund is made possible by gifts from Steven A. Hockfield ’67, and Edward J. Hockfield ’68. The Gary J. and Lori Kaminsky Endowment Fund provides unrestricted support for the Center for Jewish Studies and its teaching and outreach missions. The Kaminsky family lives in Roslyn, NY. The Kaminsky Family Excellence Fund. This is an unrestricted endowment to enable the Center director to meet the program’s most pressing needs and was established by Gary S. Kaminsky ’82. The Leonard and Tobee Kaplan Distinguished Professorship in Modern Jewish Thought. This endowment was made possible by a generous gift by Leonard ’49 and Tobee Kaplan. The Kaplan-Brauer Lectureship Fund. The Kaplan-Brauer Endowment Fund, established by Ellen and Berton Kaplan and Carolyn Brauer Hudson, supports an annual public lecture on the contribution of Judaism to Civilization. The Fund honors Hilda and Alfred Brauer and Jennie and Reuben Kaplan, the donors’ parents. The Seymour and Carol Levin Distinguised Professorship Fund in Jewish Studies. Established through a generous gift from Seymour ’48 and Carol Levin, the endowment will support a tenure-tracked professor working in the field of Jewish Studies. The Howard R. Levine Student Excellence Fund in Jewish Studies. This endowment, which supports Carolina’s outstanding students, was created by Howard Levine. The Levine-Sklut Distinguished Professorship Fund. Established through generous gifts from Leon and Sandra Levine and Eric ’80 and Lori Sklut, the Levine-Sklut Distinguished Professorship Fund enabled the Center to recruit a tenure-track assistant professor.. The Hal and Holly Levinson Fund. The Levinson Fund is an unrestricted endowment that assists the director of Jewish Studies in meeting the most pressing needs of faculty and students. It was established by Hal ’78 and Holly ’83 Levinson. The Drew and Marjorie Levinson Fund for Excellence in Jewish Studies. This fund is an unrestricted endowment that assists the Center director in meeting the program’s most pressing needs. It was established by Drew Levinson ’82 and his wife, Marjorie. The Lucius N. Littauer Jewish Studies Library Fund. Funded by a grant by the Lucius N. Littauer Foundation of New York, New York, the Littauer Jewish Studies Library Fund supports the purchase of library materials to support Jewish Studies. The Henry and Eleanor Lowet Judaica Book Fund. Established by gifts from Henry A. Lowet, the Fund supports the purchase of books and materials in Judaica. The Moses M. and Hannah L. Malkin Distinguished Professorship in Jewish History and Culture. The Malkin professorship was established through a generous gift from Moses and Hannah Malkin, both members of the Class of 1941. The Sylvia and Irving Margolis Lectureship Fund. The Margolis endowment supports an annual public lecture on the American Jewish experience, especially in the South. Established by a generous gift from Gail and Alan ’60 (MBA ’65) Fields, the lectureship honors Gail Fields’ parents. The Stephen A. and Sandra D. Rich Library Endowment for Jewish Studies. Established by gifts from Stephen A. Rich ’64, this fund supports the purchase of library materials in Judaica. The Joyce and Jay Schwartz Fund. The Schwartz Fund is an unrestricted endowment that enables the Center director to meet its most pressing programmatic needs. It was established by Jay Schwartz ’69. The Elsie Kaplan “Mother” Shapiro / ZBT Undergraduate Research and Travel Fund in Jewish Studies. This fund was established through the generosity of the Shapiro family and ZBT alumni to honor the memory of the late Elsie Kaplan Shapiro, who for many years served as housemother of the ZBT fraternity at UNC. Income from this endowment provides travel and research grants to undergraduate students taking courses in Jewish Studies. The Jack O. Spies and Family Fund. The Spies Fund is an unrestricted endowment to enable the Center director to meet the program’s most pressing needs. It was established by Peter ’65 and Linda Spies. The Babette S. and Bernard J. Tanenbaum III Distinguished Professorship Fund in Jewish History and Culture, was established through the generosity of Jay and Babette Tanenbaum of Atlanta. The Tau Epsilon Phi Graduate Student Excellence Fund in Jewish Studies was established by an anonymous donor and supports Graduate Students working in the field of Jewish Studies. The Uhlman Family Seminar Fund. Established by a generous gift from Thomas M. Uhlman, Ph.D. ’75, the Uhlman Family Fund will support an annual continuing education seminar in Jewish history or culture. The JMA and Sonja van der Horst Distinguished Professorship. This professorship was established in honor of their parents by the children of the late Johannes and Sonja van der Horst-Charles van der Horst; Roger van der Horst; Jacqueline van der Horst Sergent ’82; and Tatjana Schwendinger-with reparation funds awarded to their mother. The fund supports a distinguished teacher-scholar in Jewish history or culture.